Lost for hundreds of years, a recently recovered map of Australia dating back to the 17th century has finally been restored and put on display at a museum in Canberra. The document chronicles the mapping efforts of explorers a full 100 years before Captain James Cook set sail for the Pacific. It’s called Archipelagus Orientalis (Eastern Archipelago), and it was created by master cartographer Joan Blaeu in 1663. The document, known as the Blaeu map, was re-discovered in 2010 in a Swedish warehouse where the document had been languishing for hundreds of years. Yesterday, after four years of meticulous preservation to stabilize the fragile document, the map returned to its new home at the National Library of Australia in Canberra. The map is significant because it’s the first to show (most) of the Australian coastline in detail, and because it was created more than a hundred years before British explorer Captain James Cook made his famous voyages through the region in the 1770s. 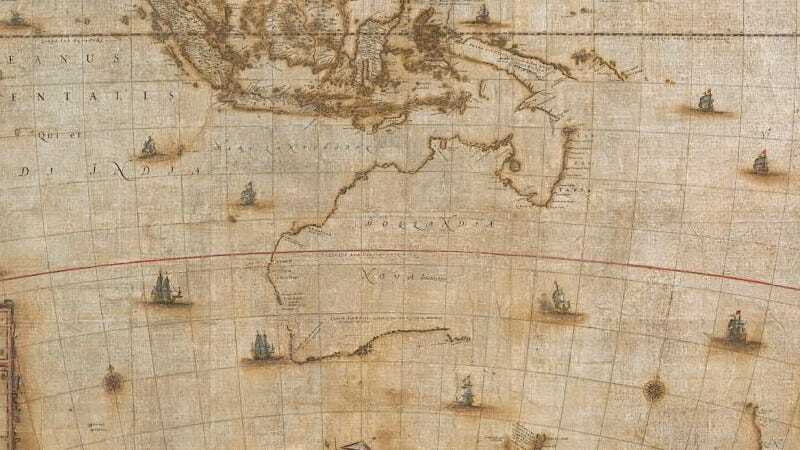 The map is also notable in that it includes the first sightings of Tasmania by Abel Tasman’s crew aboard the Zeehaen in 1642, while also documenting the Dutch discovery of Australia. This map of “New Holland,” as it was called back then, measures 46 inches by 60 inches (1185 mm x 1520 mm), and it was used a template for all of Australia until the times of Cook’s voyages. Although in this map Australia is the centre of attention, to Blaeu and his countrymen it was a puzzle. They cruised the coast, they cruised the north, the south, the west, looking for trading opportunities, occasionally landing, not finding people with goods they recognized they could trade with, sailing off again. Some years later curiosity would get the better of them and another voyage would occur and this pattern continued until they decided to concentrate their efforts in the Spice Islands [in Indonesia] and they left this enigma of Australia alone. Blaeu’s Map will be on display as part of the museum’s Mapping Our World exhibition in the Library’s Treasures Gallery until next year.